Cupcake decorating is quite the art. 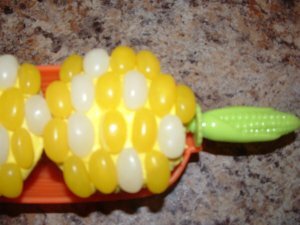 I love making a large batch of cupcakes for all parties and usually use a cupcake holder or cupcake tree, but this time I saw this inventive idea to make cupcakes that look like sweet corn which was perfect for my summer time barbeques. I made regular cupcakes from a yellow cake box. Very simple! I used white cupcake liners to bake the cupcakes in. Here is the hint. You want your cupcakes to have a flat top, so fill the cupcakes ¾ of the way and then set your oven temperature 25 degrees less than recommended on the box. This takes a couple extra minutes to cook (test for readiness with a toothpick) and then the tops are level. Next, for the icing I made a regular butter cream icing (for this technique a store bought icing would work fine). I tinted the icing a pale yellow using Wilton Golden Yellow icing color. When the cupcakes were completely cooled I just made a simple smooth icing over the cupcakes. Then I covered the tops with yellow and white jelly beans. I purchased then at a local bulk food store. I was very careful to select the colors that I wanted (any extra colors of jelly beans would look pretty in a little dish). I was careful lining the jelly beans in straight lines and tried to be random with the yellow and white jelly beans. To finish off the corn on the cob cupcakes I placed them into a corn on the cob dish and then placed the corn on the cob holders at either end. I had the sweet corn cupcakes placed at each guests place throughout the meal. These cupcakes were beautiful and a perfect yummy table decoration for any BBQ.